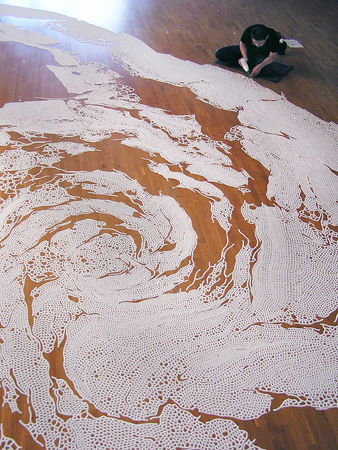 The Laband Art Gallery at Loyola Marymount University is the site of an exhibit entitled “Return to the Sea: Saltworks by Motoi Yamamoto,” opening this Saturday. Prior to the opening, the public is invited to watch the Japanese artist from Kanazawa City, Ishikawa Prefecture, as he works on the centerpiece of his exhibition: a creation for which the artist is using 400 pounds of salt to draw on the floor of the gallery. The exhibition, which also includes photographs of the artist’s works and a video of him creating his salt artwork, will run through Dec. 8. On the last day, the public is invited to dismantle the exhibit and throw the salt back into the ocean near Playa Del Rey. This is the first exhibition on the West Coast for the world-renowned Yamamoto. The 46-year-old artist was born in Onomichi, Hiroshima. Yamamoto graduated from the Kanazawa College of Art in 1995 and has been actively creating salt works over the past 20 years. He arrived in Los Angeles from Japan on Aug. 25 and started working the next day. On the first day, Yamamoto marked up the 862-square-foot floor of the gallery into one-square-meter (3.3 feet) grids. His aim is to complete eight grids a day, meaning that the work is expected to take 10 days. “Towards the end, I may need to work 15 hours a day to complete the work,” he admitted. Why does he use salt? Yamamoto said he was inspired by the experience of attending the 1994 funeral of his sister, Yuko, when he was 27 years old. Just two years earlier, while she was studying nursing, she was diagnosed with brain cancer. She died at age 24. “She knew she had cancer, being a nursing student, and she knew she did not have long to live,” recalled Yamamoto. In those days in Japan, doctors did not normally fully inform cancer patients or their families of the diagnosis, but the Yamamoto family knew Yuko did not have long to live. Struggling to come to terms with the enormity of the loss, Yamamoto, then a recent graduate of Kanazawa Art University, turned to salt. “After the loss of my sister, I started creating pieces with the theme of ‘human death’ and capturing the surrounding events associated with a death. I had been using glasses, stones, even plants and made a connection to salt at the funeral. But I did not expect that I would have been using salt this long,” Yamamoto explained. Salt in Japanese culture is used for purification and is believed to ward off evil spirits and attract benevolent ones. In addition to funerals, symbolically-rich salt can be found at businesses, homes, and even sporting events. Sumo wrestlers famously toss salt onto the ring before each match for good luck. 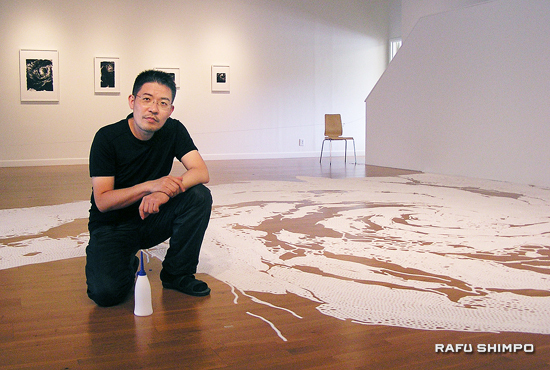 Motoi Yamamoto creates his artwork of salt for his exhibit opening Saturday at the Laband Art Gallery at Loyola Marymount University. At the close of his show, the public will be invited to dismantle his pieces and fling the salt into the Pacific Ocean. “At the beginning, I was creating the salt work privately because it was my process of remembering my sister and accepting her death,” Yamamoto said. Over time, the transcendent beauty of his creations attracted attention, and his work of personal grief became a lifelong labor of love. Nearly five years later, his salt installations have received numerous art awards, including the Phillip Morris Award in 2000 and 2002. Yamamoto has received grants from the Pollock-Kraisner Foundation (2003) and the Voyager + AIT scholarship program in Tokyo (2010). His body of work includes Zen gardens, stairways, landscapes and buildings. Anything can be a subject of his salt artwork. A few years ago, however, the artist began exclusively drawing intricate, two-dimensional labyrinths in large spaces. “For me, the labyrinth is the symbol of being reborn and life itself. We experience deaths but we also have births,” he said. The sand mandalas of Tibet, which were the original inspiration for the labyrinths, are a symbol of reincarnation and the impermanence of life. While working, Yamamoto sits “agura style” (cross-legged) on a yoga mat, bending slightly forward to meticulously draw lines of salt on the floor. He works monastically for 10 to 12 hours a day, taking a few short breaks to stand and move about, as the postures and effort are at once peaceful and brutal. He uses a plastic dispenser that he fills with salt and applies pressure on, so that the right amount of salt comes out the small funnel tip as he draws his lines. Yamamoto’s parents used to run a bike shop and an oil bottle was a familiar item, so he started using this to dispense the salt. A yoga mat has just the right thickness for sitting for extended periods, and he tapes his knees and back to provide additional support for his movements. He also takes aspirin every morning before starting his work to prevent pain. While drawing, he achieves a state of transcendence akin to deep meditative states. Yamamoto said he usually will have at least one vivid dream of his sister during these installations. People ask him if he erases his mistakes. On other occasions, human-made and natural events impinge upon his creations. An infestation of insects once crawled upon his pristine lines of salt. On another occasion, a vacuum cleaner got a little too close. Perhaps this too is the inevitability of disruptive life events. During his first three days of installation, more than 170 students and additional people from the public have come to see the art in progress. “I hope that by looking at my work, students will see how important it is to keep doing the small things and then eventually something large will be realized,” said Yamamoto. His art studio is located in Kanazawa city, a city on the Sea of Japan near the Japanese Alps. Yamamoto works as an administrator in an iron works factory in the city. Being employed full-time, he uses his vacations and leaves of absence to travel abroad and create his art. His work has been exhibited in Japanese the cities of Kanazawa, Yokohama, Tokyo, Toyama, Hiroshima, Kyoto, Fukui, Hakone and Fukuoka. Overseas exhibits include London (2003) France (2010), Greece (2006), Germany (2002, 2009) Italy (2005), Jerusalem (2005), Mexico (2000), Korea (2011) and other cities. In the United States, Yamamoto’s exhibitions have been held in Washington (2012), New York (2003), Charlotte, North Carolina (2006) and Charleston, South Carolina (2006, 2012). His current exhibition will be held next March at the Mint Museum in Charlotte, North Carolina, and in June at the Monterey Museum, in California. Yamamoto and his wife, Atsuko have a six-month old girl, Yuno. whose name includes a kanji character from his late-sister’s name. More examples of Yamamoto’s work can be seen on his website. The Laband Art Gallery is located on the campus of Loyola Marymount University in the Westchester area of Los Angeles. Hours are Wednesday through Sunday, noon to 4 p.m. Admission is free. For more information, click here.